in New Paltz Rural Cemetery. J., and Stephen I. Maria died August 7, 1883 and Stephen died February 24, 1888. Jane Deyo – born October 18, 1826, died December 8, 1871. She never married. 5, 1871 and Eliza died April 6, 1899. Elmira Deyo – born March 4, 1833. On December 31, 1857 Elmira married William W.
October 9, 1887. Elmira is buried in New Paltz Rural Cemetery. Amelia Wood, daughter of John R. Wood and Alvina Bedford, born October 19, 1849. (Jennie) (1878). 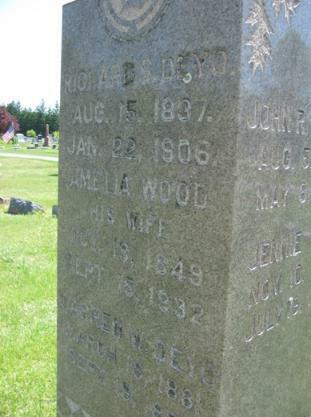 Richard died January 23, 1906 and Amelia died September 15, 1932. Cornelia died May 29, 1927. Paltz Rural Cemetery in Ulster County, New York.